We’ve been having an awesome summer at Sheri Griffith Expeditions! We've met many new friends, and we've been happy to reconnect with old friends, too. In the past, we've experienced a general slowdown in July as the temperatures rise and the high water levels drop, but this year has still been pretty busy! 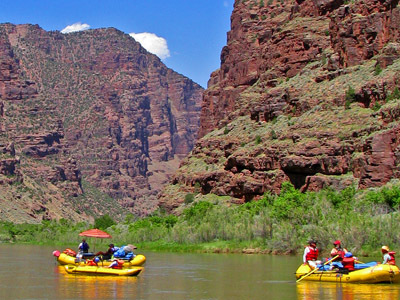 We still have trips headed down Cataract Canyon on the Colorado River and through the Gates of Lodore on the Green River, as well as lots of Westwater Canyon rafting happening over the next few weeks. Many people think that Moab is just too hot to visit Moab in July and August, and with temperatures in the 100 degree range, we'd probably agree, if we didn't know that with warmer air temperatures come warmer water temperatures. Right now the Colorado River is about 70 degrees Fahrenheit, which is GREAT for swimming! 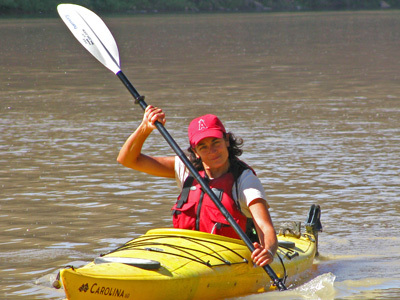 Also, to beat the heat, our guides love the Gates of Lodore Rafting trip on the Green River. This trip starts at a higher altitude, and thus has a bit cooler temperatures than the Colorado River trips. Another September trip that we are excited about is our John Wesley Powell 12 Day Expedition, which combines 5 days of kayaking in Labyrinth Canyon with 8 Days of hiking and rafting through Cataract Canyon. We're not planning on running this trip again for a few years (ask about our exciting John Wesley Powell Sesquicentennial Trip for 2019! ), so if you've been thinking about this one, now is the time to book your seats. We also have Cataract Canyon and Westwater Canyon rafting trips scheduled throughout the rest of the season.